Winter Murray is a chimera, haunted by the ghost of her never-born twin sister. Because of this, her parents and everyone else thought her insane. Everyone in the “normal” world, that is. Marcus, a necromancer, knew differently. So did Grannie Annie, who stole the tormented child from Marcus after he abducted her from her parents. It was Grannie Annie who taught Winter how to use her so-called gifts before she passed on. Now, Winter is a necromancer, tied to the land of the dead by the essence of Summer, her never-living twin. Currently, Winter has a new problem that’s also an old one. Marcus, whom she helped Grannie Annie destroy, has managed a come-back from death and is currently using his shadow twin to animate a cult within the church of the Risen Redeemer. Winter’s friend Tammy’s late mother was a member and while arranging her funeral, there’s a chance Tammy may be sucked into something worse than a prayer meeting as Marcus plots his revenge on Winter for helping kill him the first time. Winter may have to call on a few associates for help. That group—never call them friends—are a diverse crew. There’s Christophe, a vampire, who always looms (vampires are great at looming) and would love it if Winter would let herself fall under his spell; McCoy, a living skeleton, who prefers wearing dead men’s clothing and has Winter do little “tasks” for him occasionally; and Frank, a composite man Winter has promised to help die. Someday. There’s also a new monster on the block, William Cairns, fairly human and a hunter—and a pretty good-looking one at that—and his dog Cerberus, a Hellhound. Billy’s been hired by the Kingdom to bring back Marcus. Billy wants to tag along but Winter doesn’t want to be bothered by a guy just then, even one with a Tom Selleck moustache. He’ll just get in the way. Nevertheless, he invites himself, and Cerberus, too. Who knows? Maybe having a man with a Hellhound on a leash will help as Winter prepares to fight the man who brought her into the shadows and is so strong he’s managed to survive the kingdom of the dead. Some novels “warm up” the reader with introductions to characters, trotting them out with neat little résumés. 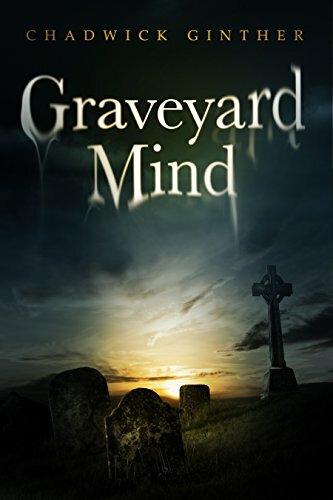 Graveyard Mind drops the reader directly into the story and lets him sink or swim in learning who’s who and what’s what. Considering all that’s going on, perhaps that’s the best way. Set in Winnipeg, this story is full evidence that ghosties and ghoulies inhabit places other than the United States and Transylvania. According to author Ginther, Canada’s necro-underworld is crawling with revenants of all shapes and sizes, with some having attractively gregarious natures. It’s a good example of the fact that a completely other existence may exist in a city a person thinks he knows well, and a place seen in daylight takes on a complexion of a deadlier hue once the sun goes down. With old friends lost and new associates added, and a few threads still unraveled at story’s finish, it may be expected those loose ends will lead into other storylines and be tied together in future novels. If this is the case, the sequel to Graveyard Mind and the further adventures of Winter et al, will be eagerly awaited.